Certified Business Continuity Professional (CBCP) is a professional certification sponsored by DRI International (DRII). Candidates for the certification must meet requirements set by DRII. 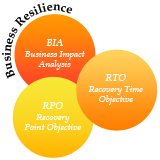 DRI International certifications are recognized worldwide as the credential for business continuity management and acknowledge an individual’s effort to achieve a professional level of competence in the industry.The CBCP certification demonstrates enterprise wide knowledge and skill in the business continuity / disaster recovery industry and serves as a standard of excellence in business continuity management. Certified Business Continuity Professional (CBCP) is reserved for individuals who have demonstrated knowledge and working experience of greater than 2 years. They must be able to demonstrate practical experience in 5 of the subject matter area of the Professional Practices for Business Continuity Professionals specified by DRII. This workshop will help participants prepare for the CBCP certification exam from DRII. The roles of the BC planner, business components and executive management in developing, testing and maintaining BC plans. The CBCP certification would immensely benefit those aspiring to for a career as a Business Continuity Professional. The Professional Practices for Business Continuity Professionals are defined as the skills, knowledge and procedures BC professionals need to lead a BC planning effort. Each professional practice has a relevant case study with set of review questions.